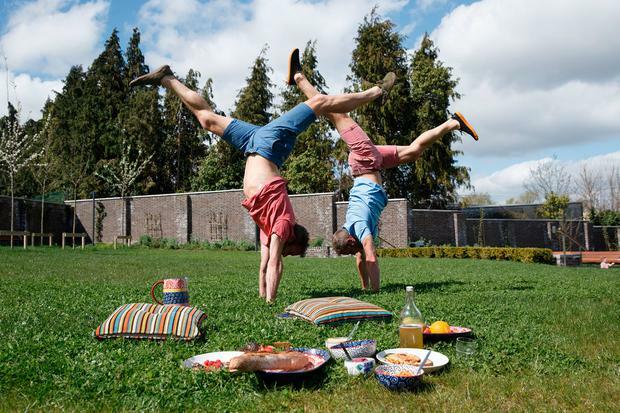 On arrival at the recently opened Happy Pear café in Clondalkin, I am greeted with a familiar sight: the Flynn twins are upside down in a 'mirror-style handstand' getting their photo taken. In between shots, they are swiping food off plates, handing it to passers-by and stopping to chat to everyone. Their energy is palpable, akin to a small child after they've consumed a giant bag of sugar cubes. When they talk it's with a ragged, energising symphony of sentence-finishing, often speaking in unison interrupted with raucous laughing. I had spent a week with the Flynn boys last summer working on their third cookbook, Recipes for Happiness, and was both amazed, impressed and exhausted by their verve for life. There can be a kind of obnoxiousness to people who are 'living their dream' but their moxie for life and healthy food is both genuine and infectious; this is them at 4am when they get up for their daily sunrise swim; this is them after a long day of appearances and demos, and when they're testing recipes for the 30th time. It may seem as though their primary concern is having fun but make no mistake, there is serious brains (they speak seven different languages and both hold Masters degrees in business) and dogged determination behind the well oiled Happy Pear machine, which now employs 170 people, and manufactures 27 products for retail. "We're like a pair of puppy dogs wagging our tails," laughs Dave reflecting on their 'work' day. "But it's not work when you're doing something you love." Such is the boys' insatiable curiosity and work ethic, I'm wondering whether they ever switch off. "Why would you switch off if you love it?" quips Dave. But, surely they must wind-down at some point, after all they are human, not machines. "We do get tired and, yes there are days where it is overwhelming; we pack a lot in, which is why we go to bed early. But it's the mornings that I find the most peaceful," notes Steve. "When we go down to the beach in Greystones for our ritual swim in the sea, we stand around chatting, drinking tea. There's nowhere to be and we're in no hurry. There's something really lovely and peaceful about that." This, they admit, would be the start to their perfect summer's day followed by breakfast with their families and 'playing shop', which may involve travel, cooking demos, TV or radio appearances, testing new recipes, recording for their YouTube channel or working in the café. It sounds like they're living their 'perfect day' everyday. "We are," they laugh in unison. They don't feel the need to take 'holidays' but for the sake of their families they do spend a few weeks away from the 'office' each summer. This year Steve is heading to Italy on a camping holiday with his wife Justyna and kids May, Theo and Ned, that way he gets to 'cook his own food', and Dave is travelling around Ireland in a camper van with his two daughters Elsie and Issy. The classic Irish camping holiday, without the 99s, bags of chips, Fanta and, hopefully, pouring rain. "We did love a 99 when we were younger," admits Steve. "Actually," corrects Dave, "you loved Brunch ice-creams and I loved Feasts. They were our summer staples when we were young, sitting in our aunt and uncle's caravan in Courtmacsherry, Co Cork with our cousins, in the rain. All the adults got drunk and we were shoved out the door and told not to come back until 6pm!" But then, they were always the outdoorsy types. Steve describes their childhood summers chasing balls: rugby, tennis, golf, it didn't matter. When they weren't playing sport they were climbing rocks and swimming or "knocking around on bikes". As fearless then as they are now it would seem, which is why it comes as a surprise to learn that, given the chance to give their 20-year-old selves some advice, they both wished they'd been "less fearful". "We were always good at embracing things but I wished we'd trusted our guts more," says Steve, somewhat regretfully. "I would have looked under more rocks and down more rabbit holes," adds Dave. There was a stage when Steve toyed with the idea of becoming a monk. "I was meditating a lot back then and seriously considered training to become a monk. It was a toss between that or hedonism, that latter won," he smiles. It's hard to imagine the boys knee-deep in hedonistic adventures. They both became vegetarians, somewhat eerily, on the same day when they were 21 despite being thousands of miles apart. Now vegans, the most hedonistic detour is a few squares of dark chocolate. As guilty pleasures go, there isn't much guilt but they have come a long way. "We used to be very black and white about things. When we first turned vegan I remember saying to my granny: 'No way I'm eating that apple pie, it's an insult to offer it to me'. But granny shares her love through food so now I'll eat the apple pie despite the butter in it. I can see the value in being more casual and relaxed about eating. I just draw the line with meat," shrugs Dave, chomping on a mixed-seed cookie. The subject of health throws open a premise that underpins their third book: the fact that it's not just about eating a bowl of kale but about how you eat, when you eat and with whom you eat, and what supports your lifestyle in terms of happiness. They have learnt that thinking about food in morally loaded terms of vice or virtue doesn't work. "I used to think coffee was bad," says Dave. "Now I have two kids which means interrupted sleep and busy days and I realise its value in helping you focus. We all know a granny who smokes and drinks and is still going strong at 95, she probably surrounds herself with good people and laughs a lot," he adds with a glint. Their third book is a slight departure from their first two, its aim to deliver more accessible, practical and simpler plant-based vegan recipes and combine those with an exploration of happiness and what their experience is with it. Gone are the three-page recipes in favour of 15-minute dinners, simple soups and sweet treats, all with a nod to fantastic flavour and fast preparation. Is it safe to say it's more grown up? "Definitely, we've evolved, as has our food. The main difference is we're fathers now," notes Dave. "But as cooks you are always experimenting and pushing the boundaries of cooking so naturally we've come a long way." "We've basically learnt how to make that curry in five minutes instead of an hour," Dave interrupts laughing, adding that the scone I am eating is actually a vegan scone. I honestly didn't notice; it just tastes really good (even better with butter, don't judge me). Their father, CEO of the business, told them they were 'mad' to mess with the traditional Irish scone. But, like a red rag to a bull, they were determined to prove him wrong. It was picked above the traditional scone in every single taste test, bucking the vegan stereotype and proving their ability to make vegan food mainstream. Like everything they do, their third book is very much a team-twin effort. Steve's favourite hobby is fermentation, evident in the 'Fermentastic' chapter, which explores the process of preserving food. One of his favourite foods to eat is kimchi, a Korean dietary staple and, apparently, one of the reasons Korean female life expectancy is one of the highest in the world. That and pesto pasta, a family favourite made with their own pesto of which they produce 25,000 tubs a week. Dave prefers a good breakfast and makes the waffles and pancakes from the book most mornings for himself and his kids. But writing the chapter on happiness was the part he enjoyed the most. "Our granny once said that our motto was always to 'be happy, have fun'. That still stands. Food is just one element but underneath it is a much greater philosophy which is to surround yourself with the right people, have fun and balance the elements." They both recall attending a wellness retreat where someone asked the speaker what the difference was between illness and wellness. He walked up to the board and circled the 'I' in illness and the 'We' in wellness. "It's simple but brilliant and sums it up for me," says Steve before Dave finishes his sentence: "It's inclusion and togetherness. Happiness often gets a bad rap for being a bit, well, 'fluffy', or is often linked to values that society esteems such as money and power but it's so much more than that." Happiness is clearly a default position, so what irks them? 'Prooooocceeddurres," drawls Steve throwing his hands to his head dramatically. Dave is nodding in agreement. "We thrive on open spaces, chaos and spontaneity but you can't run a business like that. I just find it frustrating sometimes," admits Dave. When you employ 170 people you have to let go of some control it would seem, something the boys have had to practice and agree has helped them with overcoming their fears. "The business has grown so much that we are limited in what we can do. When you're a twin and as close as we are, there's a constant feeling of someone having 'your back' so to speak, so it gives you the encouragement and confidence to try new things and be bold, even if they're crap," laughs Dave, before Steve continues. "We're all about the ideas and making them happen and less about the boundaries, structure, admin and management. We still have a separate office to everyone else. We definitely aren't structured." Sitting in the café garden in the sun, dressed in shorts and vests, tanned, clear-skinned faces and yoga-honed bodies, nibbling on an array of healthy morsels from the café kitchen, they are a persuasive advertisement for their brand. They talk without filter, never missing a beat or a chance to wax lyrical about some new food or process they've discovered. Lately it's all been about mushrooms and chocolate. Steve is off on a passionate pique about bean-to-bar creations while Dave is happy foraging for wild mushrooms. Everything they do is approached with enthusiasm and a good dose of healthy competition. This month they go head-to-head in a 'granola-off' with the launch of Steve's Dreamy Granola and Dave's Cocoa Crunch. "We're going to see which granola the public prefer," pipes Dave. "Or which twin," laughs Steve. When it comes to summer, they're all about the grill. "Our family were big into barbecues when we were young. We've just tweaked the ingredients slightly. There's nothing like a plate of colourful roasted vegetables and our version of the Philly cheese steak or hot dog," says Dave making animated eating actions. They'd follow this with simple stewed rhubarb, one of their favourite summer ingredients, or a bowl of fresh berries. And, if they were facing the green mile, would that be their 'final feast'? They pause, for the first time during the interview and adopt mirror chin-stroking poses. Then Dave breaks the silence with an ardent description of an organic black mission French fig, at its ripest, and juicy Champagne mangoes. "Throw in a few macadamia nuts and I'd share it with him," quips Steve. Even death row can be a happy place it seems, once they have each other and a menu of favourites. 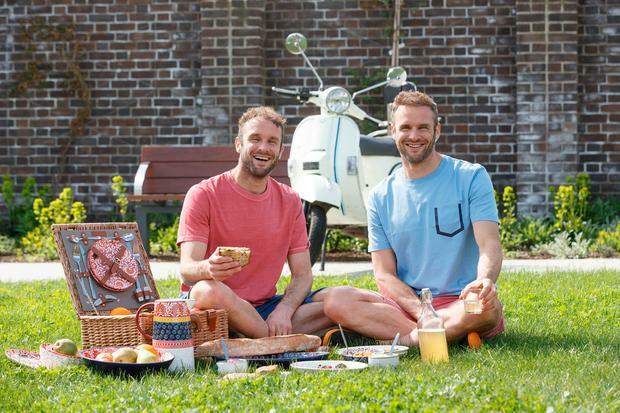 There's a kind of naïve 'can't-quite-believe-it' narrative to the Happy Pear tale, one that is driven by their love and passion for health food and pursuit of happiness. I'll admit their authenticity is refreshing, a much needed antidote to what can sometimes be a very cynical world. "We want to be shiny, happy old men," they both say together, veteran double-act style, before giving their best impressions of shiny, happy (young) men and reminding each other of one of their favourite quotes by Roald Dahl: 'A person who has good thoughts cannot ever be ugly. You can have a wonky nose and a crooked mouth and a double chin and stick-out teeth, but if you have good thoughts it will shine out of your face like sunbeams and you will always look lovely.' "Isn't that great? It's what we aspire to be," sighs Dave. I've no doubt they're halfway there. It would seem the mighty march of the Happy Pear boys has no boundaries, just the way they like it. When travelling, healthy options can be hard to find and you won't always have time to search for them. However, it's actually pretty easy to keep on track with your healthy eating lifestyle if you just think ahead. We travel a lot these days, and often the journeys are lengthy, as we're called to London or to the other side of the country for talks, demos and book signings. It's something we enjoy, but it requires a bit of planning as far as us two food monsters are concerned. When we travel we always bring a food bag. That way we can eat healthily on the move. Generally we pack fresh fruit, wholegrain crackers, hummus, pesto, avocados, dried fruit, nuts and seeds. We often leave early to catch flights to London, and sometimes joke that people would think we have food hang-ups given the amount of stuff we bring. But by the end of the day generally we wish we had brought more! More is always better when it comes to the amount of provisions you carry - a well stocked food bag lessens the potential for resorting to the fast food counter or vending machine when the munchies call. It also allows for delays. And being well-fed heads off any travel-induced rage. Even for family holidays, we always bring basic provisions with us like oats, snacks, spices, and some of the kids' favourites that we might not find en route or at our destination. It's amazing the power that a food bag can have when it comes to ending tantrums and sibling squabbles! When we make up these bags we are a bit conscious of how neurotic we might look, but it's actually about practicality and convenience. This way we have a no-fuss way of making sure we eat the way we want to eat and don't waste time looking for suitable food when we're on the move. This is a good one — we got the chefs in our main kitchen to try them, and their verdict was that they were super tasty and very close to the real deal. These freeze really well and keep for about three days in the fridge too. Simply heat up in a pan for 2 minutes each side (defrosting them first, if frozen), until golden. Makes 6-8 hot dogs. 65 minutes. 1. Peel and finely chop the onion and garlic. Put the oil into a small pan on a high heat, then add the onion and garlic and cook for 2 minutes, stirring regularly. Transfer the onion mixture to a food processor. 2. Drain and rinse the beans and add to the processor along with the vegetable stock, tamari, tomato purée, smoked paprika, coriander, cumin, mustard, black pepper and salt. Blend until smooth. 3. Put the vital wheat gluten into a large mixing bowl along with the oats, nutritional yeast and ground flax seeds, and mix well. Add the contents of the food processor to the bowl and stir until combined. If it seems too dry to come together, add another tablespoon or two of vegetable stock. Knead by hand in the bowl for about 2 minutes, until it all combines into a lovely well formed ball. 4. Set up a steamer over a pot of water and bring the water to the boil. 5. In the meantime, cut 6–8 pieces of tin foil or baking parchment, each about double the length and width of a regular hot dog. Divide the mixture into 6 or 8 equal pieces. Place a piece of foil or parchment on the counter. Roll a piece of hot dog mix between the palms of your hands until it’s about the size and shape of a hot dog. Place it on the foil or paper and roll it up, pressing lightly with your hands, to give it an even shape, then fold or twist the ends closed. Repeat with the remaining mix to form 6–8 vegan hot dogs! 6. Place all the hot dogs in the top of the steamer, cover, and steam for about 40 minutes. Remove from the heat and allow to cool slightly before unwrapping. If you want to keep your hot dogs to eat at a later time, store them in a covered container in the fridge for up to 3 days. 7. To cook, simply put 2 tbsp of oil into a non-stick frying pan on a high heat, place your hot dogs in the pan and cook, turning them constantly, till they golden up and start to smell delicious. 8. 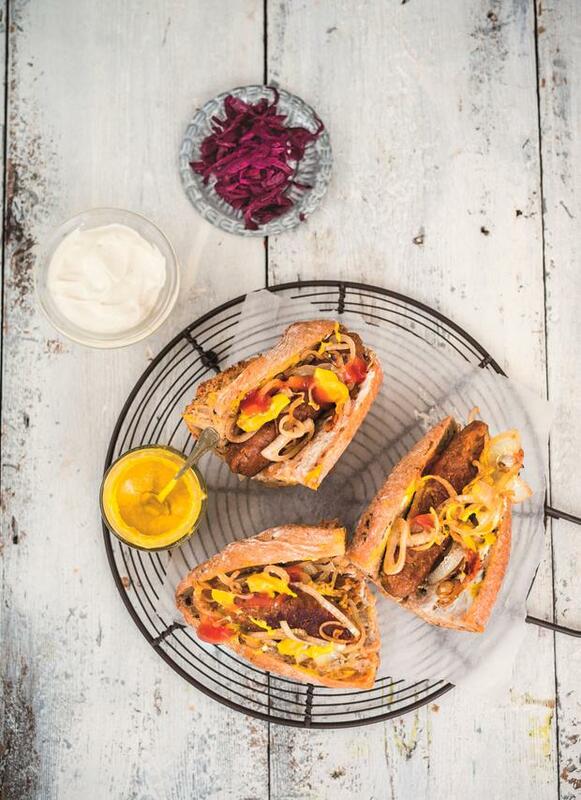 Serve in a baguette or hot dog roll, with some vegan mayo, sweet chilli ketchup, mustard and kimchi (or any other type of pickles). 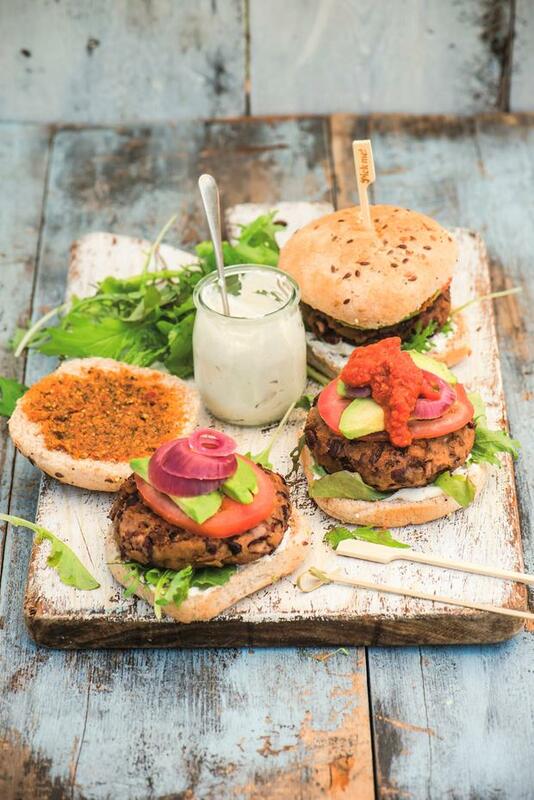 Quick, easy to make, super-tasty, moreish — we are aware that’s quite a promise, but these burgers will deliver! It’s hard to get good quality breadcrumbs, so we usually make our own by putting a few slices of decent bread into the food processor for a few minutes until they turn to crumbs. It is really worth seeking out the nutritional yeast, as it gives a nice distinct flavour, and a couple of slices of vegan cheese, while not essential, takes these burgers to the next level. Makes 3 burgers. 15 minutes. 1. Drain and rinse the beans. Peel and finely chop the onion and garlic. Chop the mushrooms very finely. 2. Put 2 tablespoons of oil into a frying pan on a high heat. Once hot, add the onion and garlic and cook for 1–2 minutes, stirring regularly. Add the mushrooms and cook for a further minute. Now add the tamari, and fry for 2 minutes. Remove from the heat. 3. Put the breadcrumbs, beans and nutritional yeast into a bowl and mix well. Add the mushroom mixture to the same bowl and mix. Leave to cool for a minute, then use your hands or a wooden spoon to mash and mix everything together. Shape this mixture into 3 burger-shaped patties, making sure to really compress them so as to remove as much moisture as possible. 4. The patties are now ready to cook. We usually fry them in the pan in the remaining tablespoon of oil for 2 minutes on each side, until they go golden. You can also bake them in the oven at 180°C/350°F/gas mark 4 for 10 minutes, or throw them on the barbecue. 5. Serve in toasted burger buns with hummus/mayo on the bottom of the bun, sweet chilli ketchup/pesto on the top and any of the other topping options you fancy. 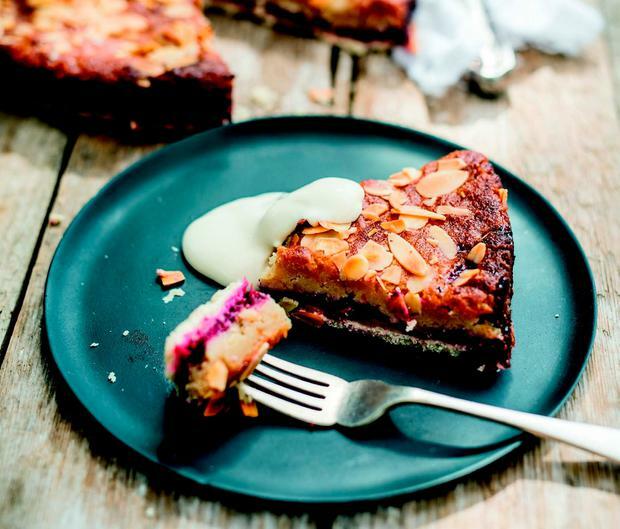 This is a wonderful traditional summer fruit dessert, with shortcrust pastry, a jammy fruit layer and a wonderful delicate almond layer, known as frangipane. For a gluten-free option, just replace the white flour with buckwheat or gluten-free flour. Makes 10-12 slices. 60 minutes. 1. Preheat your oven to 180°C/350°F/gas mark 4. Line the base of a 23cm springform cake tin with baking parchment. 2. Start by making the pastry. Put the flour into a large mixing bowl. Finely chop the coconut oil and add to the bowl with the salt, then massage with your fingers until the coconut oil has mixed with the flour to form a breadcrumb-like texture with no lumps — about 3 minutes. 3. Add 3 tablespoons of water, and press the mixture together into a firm ball. Add another tablespoon of water if it’s not sticking together yet. Wrap the dough in clingfilm and put it into the fridge for 5 minutes to firm up. 4. Lightly coat your hands with flour. Shape the dough into a disc about the size of the springform tin base, and press firmly into the bottom of the tin so that it makes a layer about ƒcm thick that evenly covers the whole base, but not the sides. 5. Pop the cake tin into the preheated oven for 10 minutes to blind bake (no need for baking paper and dried beans). Take it out of the oven and place on a rack to cool, leaving the oven turned on. 6. Next, make your frangipane mixture. Put the ground flax seeds and water into a bowl, mix well together and set aside until you have an egg-like consistency. Melt the coconut oil in a small pot over a high heat. Once melted, transfer to a mixing bowl, add the ground almonds, maple syrup, baking powder and the flax egg, and mix until everything is well combined. 7. To make your strawberry or raspberry jam, chop the strawberries finely (no need to chop if using raspberries) and put the fruit into a medium-size pot along with the water. Cook over a medium heat until the fruit starts to break down, which should take a couple of minutes. Add the maple syrup and chia seeds, bring to the boil, then simmer for 6–8 minutes to reduce and thicken. Stir regularly to prevent the jam burning or sticking to the bottom. Remove from the heat, transfer to a bowl and leave to cool and firm up. 8. Cover the cooled base with all the jam. Next, gently spoon the frangipane mixture on top of the jam layer, making sure to cover it all. If any pink or red colour from the fruit comes through the frangipane layer, that’s fine — this will make it look more authentic once it’s baked. Sprinkle on a layer of flaked almonds. 9. Pop the tart back into the oven and bake for 30 minutes. Once baked, take out and leave to cool for about 15 minutes before slicing and devouring! We came up with more than 10 different versions of these one afternoon, trying to get the right texture and bite while keeping the recipe easy and quick to make. We reckon we got it right with this recipe — let us know what you think! Makes 10-15 nuggets, 25 minutes. 1. Soak the cashew nuts in boiling water, leave to sit for 10 minutes, then drain. 2. Put your oat flakes into a blender and blend for 30 seconds till they form a flour-like powder. Transfer the blended oat flakes to a food processor and add all the remaining nugget ingredients, starting with the water and remembering to include the drained cashew nuts. Whiz until it all starts to come together into a dough (about 30 seconds). If you think it needs more moisture, add an extra couple of tablespoons of water. 3. Remove the dough from the blender, bring it all together with your hands and start forming it into small nugget shapes. 4. In a bowl, mix the breadcrumbs and turmeric for the coating. Put some milk into a second bowl and dip the nuggets in this before rolling each one in the coating, making sure they are well covered. 5. Put a wide-bottomed non-stick pan on a high heat. Once warm, pour in 2 tablespoons of oil and add the nuggets in batches that will fit your pan without crowding it. Cook for a couple of minutes on each side, until they are golden and starting to brown. Alternatively, you can bake them in a preheated oven on a baking tray at 180°C/350°F/gas mark 4 for 10 minutes on each side. 6. These are great served with hummus, sweet chilli ketchup or kimchi on the side. You could also stuff them inside a toasted pitta with hummus and slices of tomato, some vegan mayo and kimchi. Yum!